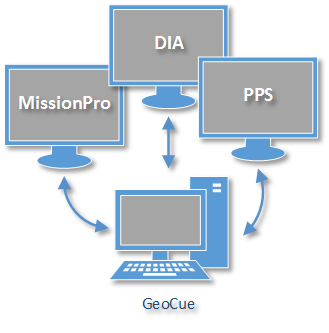 An optimized DMC workflow for the GeoCue Production Management System. 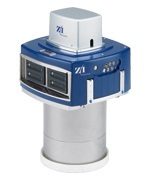 GeoCue’s DMC PPS CuePac encapsulates the Post Processing System (PPS) workflow for the DMC. 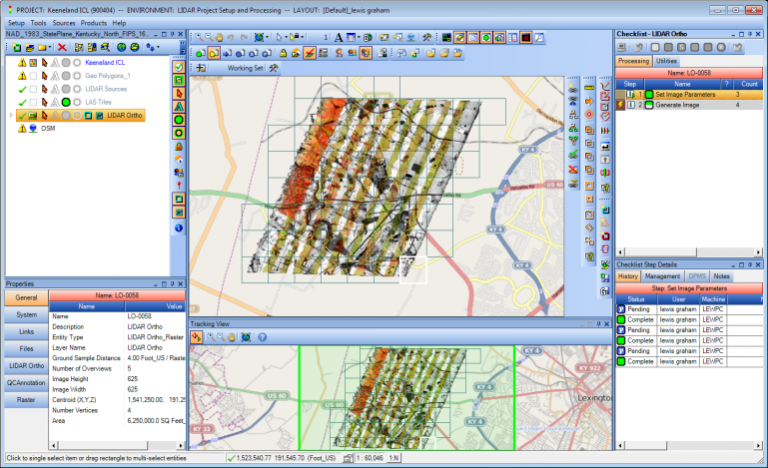 Working from within GeoCue you import an ImageStation Photograsmmetric Manager (ISPM) project created by Leica’s project planning and reporting software, MissionPro. The imported ISPM project contains references to raw DMC image and orientation data, which drives the GeoCue workflow and a map based view of the project. GeoCue integration with PPS and Digital Image Analyst (DIA) allows one or more look-up tables (LUTs) to be created, stored in the GeoCue data management system and be applied automatically during geometric processing using Z/I’s Post Processing Software (PPS). Create an integrated efficient workflow for PPS, DIA and ISPM work. PPS on GeoCue is 2.5x Faster. GeoCue’s built-in batch processing tools make distributed processing of image development across multiple machines seamless, robust and easy to manage. 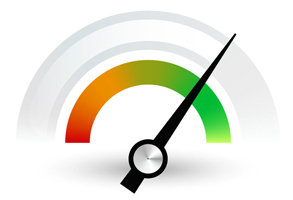 Benchmark testing has demonstrated throughput improvements of 2.5x faster image generation over standalone PPS. Standard monitoring tools and automatic email alerting systems mean unattended continuous 24/7 processing is achievable. More images processed in less time is always going to help. Map Based Interface - Fast. Familiar. GeoCue’s Map View provides a georeferenced view of your project files and data, and their status at every step of the workflow. You can instantly see the progress of an area of interest and access complete information about any project file or associated processing errors directly from Map View. See the real-time status of your project in GeoCue’s Map View. GeoCue easily scales from a single user to large enterprises with multiple sensors, projects and production technicians. Scalability and customization are built right into GeoCue. Even single person production shops will see productivity enhancements and improved project organization while large enterprises will appreciate the built-in project and data management tools suitable for large production operations. Using the integrated workflow builder, you can custom tailor GeoCue to your specific needs to automate, accelerate and manage your existing DMC PPS production workflow across any number of camera systems and production users, simplifying your production and avoiding unnecessary downtime. 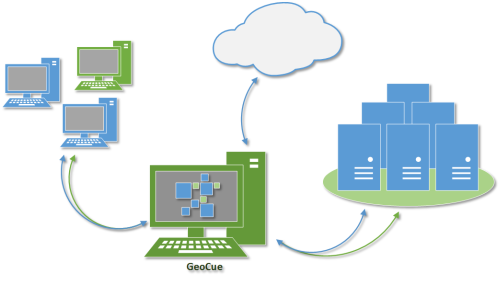 GeoCue easily scales from a single user to large enterprises. Eliminate hours of hunting for source data and manually tracking image files. Data management is handled automatically within a GeoCue project, which keeps track of all files and data associated with each project, saving you hours of ‘hunting’ for images and data. Automatic file versioning, backup and rollback capabilities are included. Critical camera calibration data is stored and linked with your project data directly, preventing costly errors due to using incorrect calibration parameters. All processing log files are automatically captured and recorded in GeoCue. Advanced query tools allow you to rapidly isolate individual photo centers based on any number of parameters including user-defined attributes. GeoCue saves you hours of ‘hunting’ for images and manually tracking data files. Gain visibility into work-in-progress on critical projects in real-time. GeoCue’s built-in tracking tools update in real-time as work is started and finished across your entire project portfolio. Finding out today you are going to miss tomorrow’s delivery is never a good thing. It doesn’t take a large network to see gains with GeoCue. 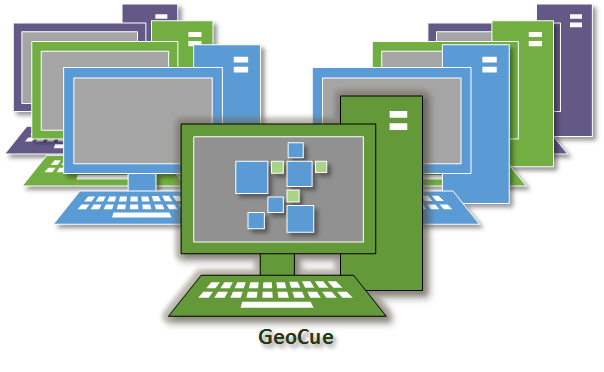 GeoCue’s Command Dispatch System (CDS), allows you to take full advantage of your hardware investment by assigning numerous machines to include in a local cluster (cloud) of processing nodes. 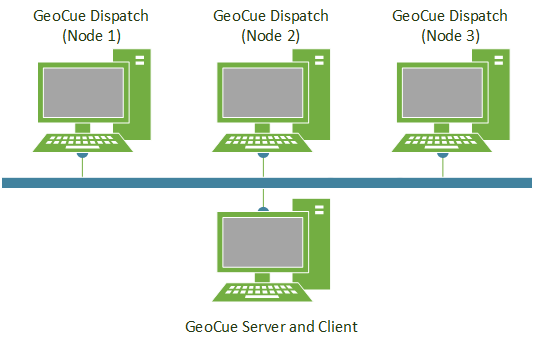 With GeoCue CDS you can dispatch commands to run on remote machines or distribute a group of GeoCue entities to a collection of machines for parallel processing. CDS gives you full control of configuring and scheduling each machine in your cluster. You don’t need a large network of machines to realize benefits from dispatched PPS processing – a small network of 3-4 machines will provide a 2 to 2.5x increase on project production throughput. 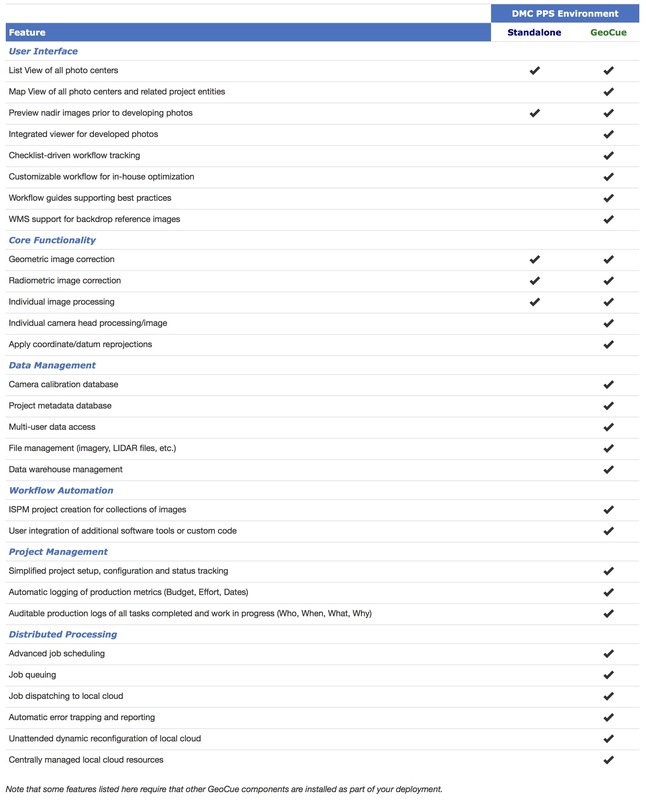 Here are some of the features you get with a GeoCue managed DMC PPS workflow that greatly extend the native capabilities of PPS. Note: Some features listed here require that other GeoCue components are installed as part of your deployment.